Project lead – Ben Ryan, Jorum Technical Coordinator. The Jorum LRMI implementation project began in September 2013 and work is ongoing as the platform develops. 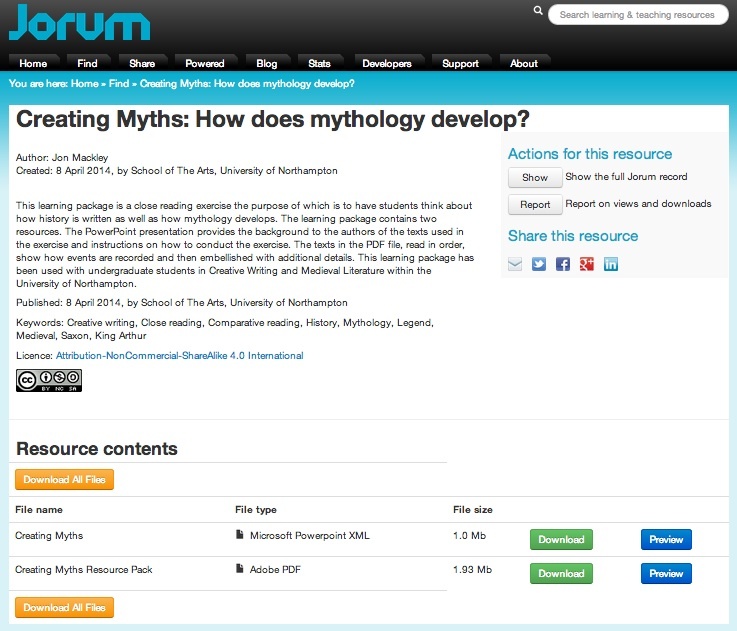 Jorum is a DSpace repository containing a wide range of educational resources in many different formats, including a considerable volume of IMS Content Packages. The repository contains approximately 16,000+ resources, most of which are openly licensed. Jorum uses a combination of LOM, DC, LRMI, Jorum metadata, plus custom fields for different collection ‘windows’. LRMI properties are crosswalked to LOM education fields. Implementing LRMI in Jorum presented something of a challenge to the project team as DSpace only allows metadata to be added to ‘items’ which are collections of individual files. Metadata can not be applied at the file level, e.g. an html page within a content package, and there is no way to add microdata to an individual page. If Jorum ingests a resource that already includes LRMI it can be cross walked to map to the LOM fields, however if a content package contains multiple pages that are marked up with LRMI it is difficult to extract this data as there is nowhere to store it in DSpace. In addition, in order to enable a search engine to access a full set of LRMI metadata it is necessary to generate a page containing the LRMI which the search engine can hit. The default page generated by DSpace only includes title, author and description. To generate a page with a richer set of metadata it is necessary to create a custom theme, which is a non trivial task. Despite the technical difficulty of implementing LRMI in DSpace, the Jorum project has made good progress and the team have plans for further development in this area including implementing the new Schema.org License property, implementing the alignmentObject and aligning it to the UK higher education Joint Academic Subject Coding Scheme. The project team also plan to build a Google Custom Search engine to demonstrate how Jorum LRMI metadata can be surfaced. Jorum has implemented the following LRMI properties and types, though this is dependent on what metadata has been supplied for each resource. The Jorum project team have not yet shared their LRMI metadata with the Learning Registry as they are waiting to upgrade their platform to DSpace 4.0 before taking this implementation forward as DSpace 4.0 includes an upgraded OAI PMH interface providing a good flexible way to generate metadata from different schema. It should be noted that Jorum have already undertaken a successful Learning Registry implementation project, the Jisc funded JLeRN Experiment ( which successfully built a Learning Registry node in the UK and developed a number of prototype services for LR ingest and querying. The same developer responsible for the JLeRN implementation has been commissioned to undertake the Jorum LRMI implementation and this work will be taken forward once the upgrade to DSpace 4.0 is complete. 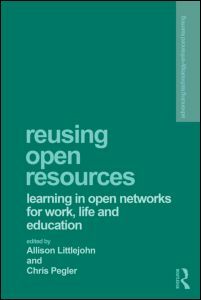 Back in 2003 I contributed a chapter to Allison LIttlejohn’s book Reusing Online Resources: A Sustainable Approach to E-learning and I’m delighted to say that, together with co-authors Sheila MacNeill and Martin Hawksey, I have another paper in the subsequent book in this series Reusing Open Resources: Learning in Open Networks for Work, Life and Education edited by Allison Littlejohn and Chris Pegler. Paul Richardson of Jisc RSC Wales acted as professional advisor to the group and undertook the consultation exercise. The report includes an invaluable background paper produced by Paul on Open and online resources: implications for practice in higher education institutions in Wales, which provides an invaluable overview of recent open education developments including OER and MOOCs, and quotes from a number of Cetis blogs and publications. Although Paul’s paper focuses on the implications of open education for Welsh HEIs I can also highly recommend is as an excellent general summary of recent developments open education policy, practice and technology. The report itself includes the following of seven recommendations addressed to the Minister for Education and Skills and higher education institutions. Earlier this week I was speaking at What I Know Is an interdisciplinary research symposium on online collaborative knowledge building organised by the University of Stirling’s Division of Communications, Media and Culture, together with Wikimedia UK. It was a completely fascinating and eclectic event that covered everything from new models of academic publishing, issues of trust and authorship, non-hierarchical networks of knowledge, extended cognition, collaborative art and the semantics of open. It’s been a little quiet on this blog recently, I haven’t been sitting around twiddling my thumbs though, far from it! I’ve been busy on the Open Scotland front and with another exciting project that Phil Barker and I will be announcing very shortly. I also seem to have got myself roped into an awful lot of conferences and events over the next three or four months. I’ve got ten presentations coming up between now and the end of June, on topics ranging from open education policy and Open Scotland, to the Learning Resource Metadata Initiative, to the crew of an 18th century naval frigate (yes really!) If you want to find out where to catch me, I’ve updated my list of Presentations & Events. I was very disappointed that I couldn’t go to ALT-C last week, but alas lack of funding meant I was unable to get to the conference this year. ALT-C is always a great networking event and an excellent opportunity to take the pulse of the education technology community in the UK F/HE sector. 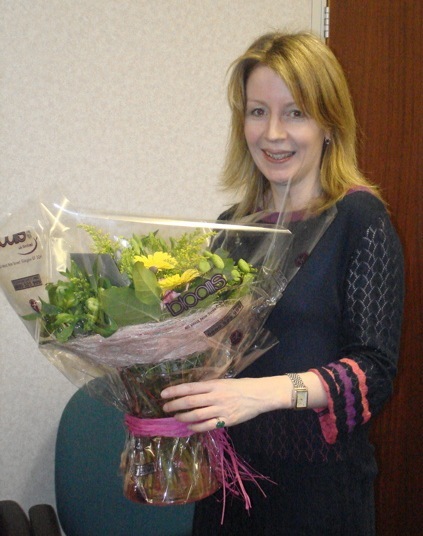 However the main reason I was so disappointed to miss ALT-C this year was that I wasn’t there to see my former Cetis colleague Sheila MacNeill win the ALT Learning Technologist of the Year award. So since I wasn’t there to congratulate Sheila in person, I’m going to do so now instead!